Whether you’re concerned about your energy costs, the planet or both, installing solar panels minimizes your monthly electricity costs and usage. In addition, improvements in efficiency and technology combined with government and municipal incentives make solar electricity more affordable for everyone! So the moment is right for solar electricity! Every week, Solaron is aiding Rocklin customers in learning more about how solar electricity will work for them. Once you elect to make the solar investment, you need to install panels that are durable, efficient and reliable. 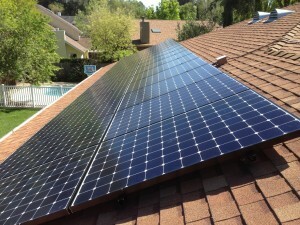 For solar electricity, Solaron only installs SunPower solar panels. Headquartered right here in California, SunPower maintains direct oversight of the entire production process. Years of applied product development enabled SunPower to lead the solar industry in efficiency combined with affordability and ease of installation. This means you will get the best solar panels available, with the least amount of trouble, especially when you select Solaron as your contractor. An Authorized Dealer with SunPower, we have a close relationship and advanced access to the panels you need for the best possible customized solar array. So for a winning combination, contact Solaron for a great product installed by a reliable contractor!